An opportunist goal from Dan Burn gave Wigan Athletic a much needed three points at St Andrews last night.With just ten games to go, Latics remain second from bottom, but they moved closer to the pack directly above them in the table, just one point behind Bristol City in 22nd place. Warren Joyce fielded a much more positive lineup and Latics were lively in the first half before falling back in stubborn defence in the second. It was an uplifting victory that keeps Wigan within range of escaping relegation. Saturday’s home match against relegation rivals Bristol City is crucial. Although delighted with the victory Latics fans are now wondering if their side can pull off another one in quick succession. Joyce’s less negative starting lineup, with Gabriel Obertan and Michael Jacobs playing wide and Alex Gilbey in advanced midfield produced a more attacking approach in the first half at least. However, to some extent it was forced on him by injuries and suspensions reducing his selection options. It is to be hoped that he will not once again resort to the ultra defensive approach we were seeing prior to the Birmingham match. We took a look at the social media following yesterday’s match and came up with a wide range of views. 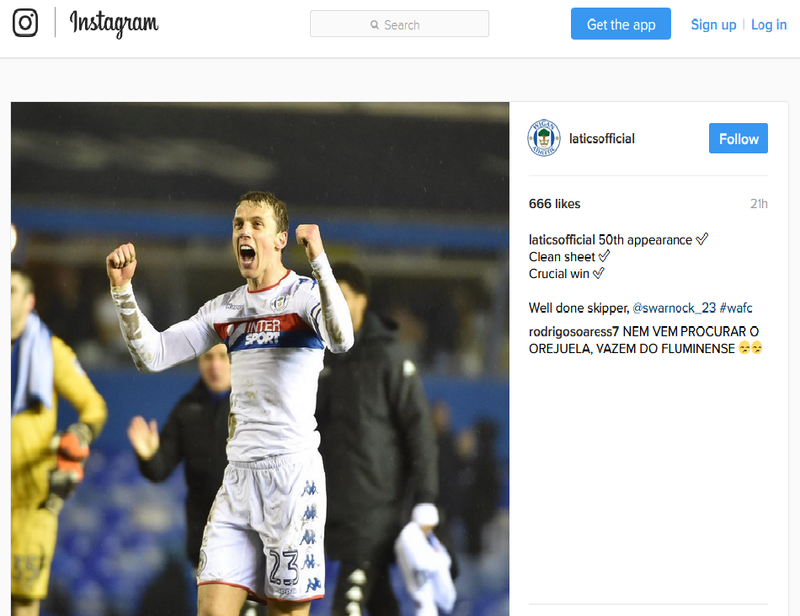 Our thanks go to the Cockney Latic Forum, Vital Wigan – Latics Speyk Forum, The Boulevard of Broken Dreams (Facebook), Instagram and Twitter for providing the media for the posts below to happen. Thanks go to all whose contributions are identified below. Hope not. Hope that Obertan is ready finally because at last we have a replacement for Yanic. Been crying out for a winger since he left. A winger with pace and who could supply decent passes over that period could have contributed so much over the last few weeks. At least 5 points lost there. I think those are fair points Whittle i fear you may be right; we’ve seen so many false dawns over the years we’d be silly to get too carried away but we’ve also seen plenty of unlilely great escapes too so i dont want to not embrace the hope either. Every revival has to start somewhere and I’m just hoping we have it in us. Looking at the form table Bristol and Wolves have fallen apart in recent weeks and Brum are in total free fall too. So i think there’s still plenty of twists and turns coming in the relegation battle i just dont know if it will be a happy ending or end in tears. I’ve not got blind faith but I’ve got some hope back after last nights results so I’m going into Saturday cautiously optimistic. Good first half, deep and nervous in the second but great 3 points. Birmingham were rubbish ref was even worse. Even brum fans were calling him. Two centre backs were terrific again, solid back four. Gilbey looks good but not match fit, missed him! We were creating chances and looking like a team. More of the same and we just might stay up. Shame the 3 B’s all got a point. Just makes Saturday’s game a step above a Must Win game! Win on Saturday we’ve still a real chance of staying up; lose and we’re in real sh!te, especially if the games in hand go against us. Bristol city game absolutely huge now. Biggest game for two seasons? !